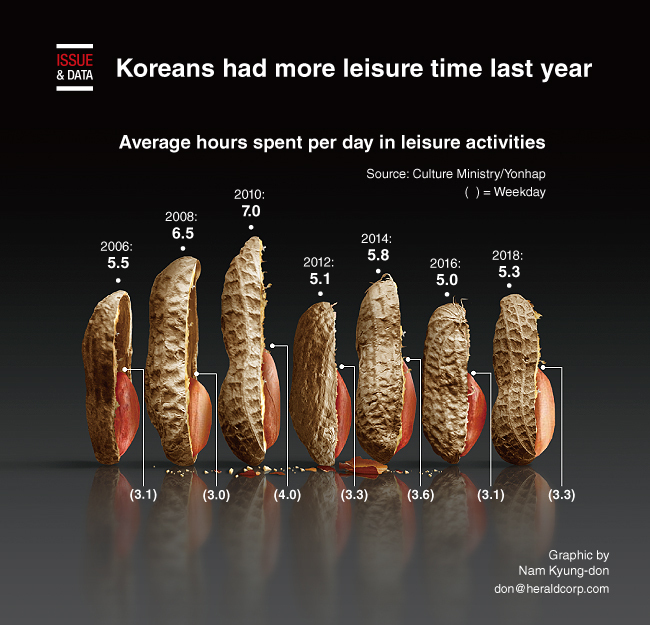 Koreans are surveyed to have had more leisure time and spent more money on leisure activities on average in 2018 than previous years. On average, people had 3.3 hours of free time per weekday and 5.3 hours per weekend, the Culture Ministry said, citing the outcome of its 2018 survey on national leisure activities of 10,498 people aged over 15 in 17 cities across the nation via one-on-one interviews. The figures were increases from 3.1 hours and 5 hours in 2016, respectively, according to the survey, which is conducted every two years. The average amount of money people spent during their free time came in at 151,000 won ($135.23) a month last year, up 15,000 won from 136,000 won in 2016, the poll showed. TV watching topped the list of activities, with 45.7 percent of the respondents doing so last year, compared with 46.4 percent in 2016 and 51.4 percent in 2014.